Taking the plunge to outsource your online marketing can be daunting. It is normally up to the agency to present the options and the strategies to get the best Return On Investment. In this conversation we discuss the difference between clients that pay you the money at the end of each month expecting to ‘get the results’ Vs clients that work hand in hand with their agency to leverage their efforts. 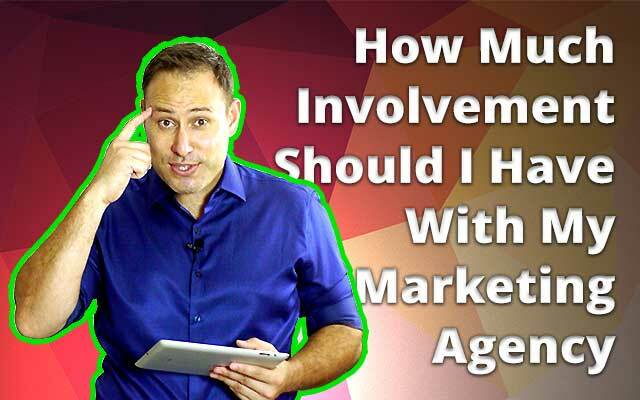 Hey, David Judge here and today we’re going to discuss How much involvement should you have when working with an online marketing agency. This is a really important conversation especially as a lot of offline marketing efforts are starting to align more closely with online efforts. I’ll explain exactly what this means and then touch briefly on how I believe businesses should be working with online marketing companies to get the best bang for your buck. First things first, when I’m talking marketing agencies we’re including any company you employ to help you with your online marketing. This includes a local guy that may be helping you with your SEO and paid ads, right up to a full service agency offering a variety of services from Data Analysis to Online Reputation management. And this raises a really good point around all of this online conversation as the internet has totally changed the way we do business offering more opportunities than ever before. When I say opportunities I mean more than online advertising, I’m also referring to really valuable information including the number of people that see your ads or website, where they are from, how long they stay and how they interact. All of this valuable information can paint a picture about your customer and you can use this information to make your business more attractive to your potential leads. Also, businesses that work closely with their online agency can gather insights into this valuable intel as opposed to just paying a bunch of money and not accessing this information. And this is a good point that I’ve noticed when working with different clients. I’ve found clients that pay you the money and expect the results to be delivered to them nearly always end up dissatisfied as there’s no communication and consultation between the 2 parties. After a period of time you end up trying to justify your existence as there is a gap. This may be (as an example) where the agency don’t quite work to target the right visitors and the clients aren’t getting access to valuable intel that could improve how they do business. As you can tell I am definitely for clients and agencies working together. Of course there is an additional investment to run this way, yet the actual return is far more solid especially if you run it as a 2 way relationship with the focus of both parties getting the best results for the client. Meaning you and I working for you. So lets break it down further and discuss 4 more benefits of online marketing agencies working closely with their clients. This should be a conversation both parties should have at the beginning and will evolve over time as the agency gains a better understanding of areas they can and cannot touch. There is nothing than can impact the way your business is seen online if the agency you’re working with delivers the incorrect message. This happened most recently working with a client assisting with around SEO to find another company managing their Social Media weren’t aware of a specific subject you simply don’t discuss in their industry. Fortunately this was picked up and removed as the potential for it to go viral was huge which would have damaged that businesses reputation. This could have simply been avoided if the agency worked more closely with their clients company and discussed the do’s and don’ts at the beginning. Whilst an external company will understand how to implement multiple strategies to bring visitors to your business, it’s important to ensure that message is being delivered in a way that fits inline with your overall direction. This applies from smallest campaigns up to multinational campaigns and like the first benefit it will ensure your target customers are receiving your message the way you would like it to be received. Some of the greatest business decisions in relation to online campaigns we’ve managed have come as a result of working with clients to get the best result. Like I just mentioned this could be in the form of how you deliver a campaign and tweaking how you could deliver it (through the sharing of valuable info around reverse engineering other campaigns and how they’ve worked best) through to brainstorming the best approach within your own industry to set up link relationships. This is about leveraging what you are doing in your business offline and how you can best use to the advantage of your online efforts. This can be something as simple as an event you’re hosting and writing and distributing an online press release around it. This can result in additional search engine visibility and public visibility. We’ve had a number of instances where a client has spoken with us about an upcoming event where we’ve created a few online strategies around that event eventually landing free TV, Newspaper and Radio exposure. This can turn into excellent exposure, online traffic and SEO benefits if set up correctly. So, there are many benefits in working more closely together as you’re able to maximise how you can really get your business found especially if you can focus on multiple rewards with the one strategy. As I mentioned this can be through combined SEO and Offline efforts (where an offline project can help your rankings). This can also show you the people that buy from you, what they when they visit your website, how they interact with your website, and finally devising additional ways to improve conversions and targeting your content in the future. These are just a few examples and by working closely with your agency you get the maximum bang for your buck. Ok, lets wrap up… in the next video we’re going to discuss ‘What a CMS should allow you to do when designing a website’. This includes SEO, Paid Advertising and Social Media functions and how they should all fit together within your website.